The Rambus 112G LR MPS PHY is a comprehensive IP solution designed to provide reliable performance across challenging long-reach signaling environments for next-generation networks and hyper-scale data centers. It supports PAM-4 and NRZ signaling and data rates from 10.31 to 106.25 Gbps across copper and backplane channels with more than 35dB insertion loss. 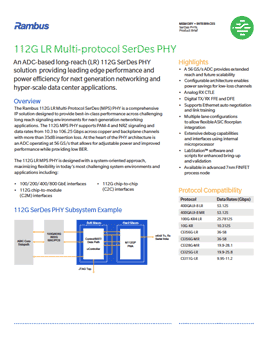 At the heart of the 112G MPS architecture is an ADC operating at 56 GS/s that allows for adjustable power and improved performance while providing low BER.